Make your kitchen the heart of your home with Dream Doors Barnham. Speak to our designers and view our stunning collection at your local kitchen showroom in Barnham, servicing Chichester, Worthing and surrounding areas. 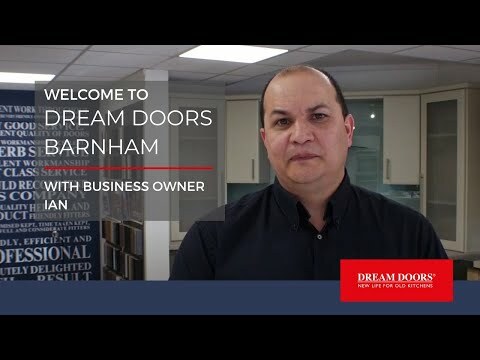 Dream Doors Barnham is your one-stop shop for kitchens. Why not visit your local Chichester and Worthing showroom to discuss your ideas with owner Neil and get a feel for our products? At Dream Doors, we supply a whole spectrum of services, from simple door swaps right through to the design and installation of new kitchens. The best place to view our products and designs is your local showroom in Barnham, near Chichester, where business owner Neil can run you through the options available for your kitchen. As all our designs are bespoke, there’s no need to worry about awkward angles or difficult corners – we will find the best way to make the chosen design work in your kitchen. Our highly personalised service is overseen by business owner Neil, so you can have total confidence that you will be kept informed throughout the process and satisfied with the end results. We appreciate that designing a new kitchen can be quite daunting. This is why, as well as inviting customers to visit our showrooms to speak with our design experts and get a feel for the quality of our kitchens, we can also visit you at home. Book an appointment with Neil, who will measure up your kitchen space and provide a free quote, based on your style preferences, with absolutely no obligation to buy. Dream Doors Barnham is ideally placed for residents living in local PO and West BN postcode areas: from Bosham, Chichester, Selsey, Bognor Regis, Barnham, Pagham, Little Hampton, Rushington, Angmering, East Preston, West Preston, Aldwick, East Wittering, Felpham, Middleton-on-Sea, Ferring, Findon, Steyning and Arundel all the way over to Worthing, Lancing, Goring-by-Sea and all local West Sussex and Hampshire UK areas. "Supplied and fitted as ordered, clean and tidy work by polite and efficient tradesmen." "First class service. Excellent can - do, professional job by fitter (ask for Lee)." "We found the staff at Dream Doors to be polite, friendly and very helpful at all times. We were very impressed with the way the work was carried out and completed. Nothing was too much trouble." "Excellent quality of work, polite, considerate and tidy. Good contact with company from start to finish." “From the initial meeting through the installation this company showed superb professionalism."